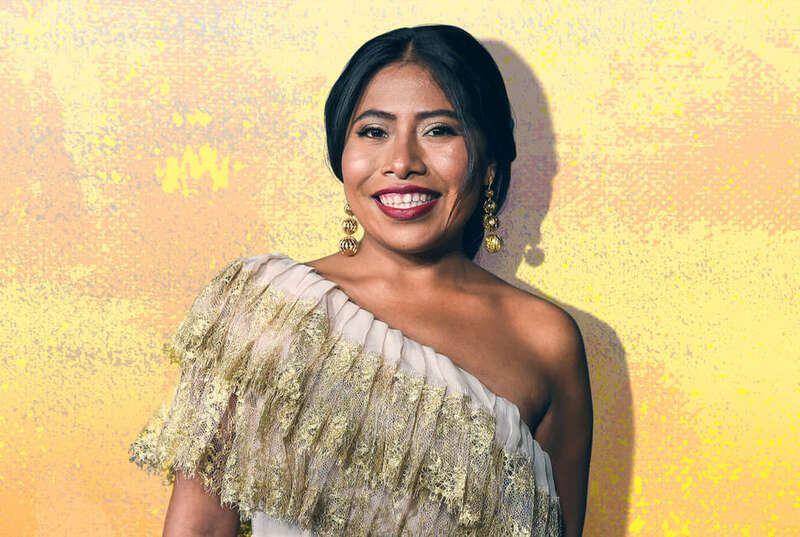 Yalitza Aparicio, a 25-year-old from Oaxaca, always wanted to be a teacher. That's what she was preparing to do when, in a strange turn of events, she was cast in Roma, the new movie from Alfonso Cuarón (Children of Men, Gravity) debuting on Netflix this weekend. So instead of a classroom, Aparicio appears in nearly every frame of the highly-acclaimed drama as Cleo, a domestic worker in an upper middle class Mexico City neighborhood in 1970 and 1971. 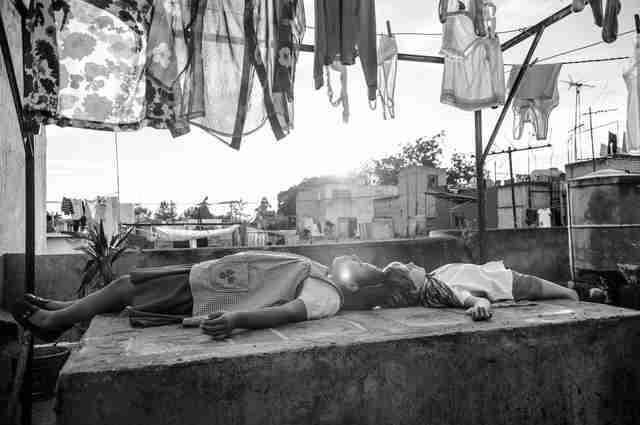 Inspired by Liboria "Libo" Rodríguez, Cuarón's own childhood nanny, Roma details the quotidian aspects of Cleo's life: the way she wakes up the children in the household, the exercises she does before going to sleep, her ill-fated romance with a young man studying martial arts. Aparicio's performance has a distinctly "who is that?" quality to it. Cleo is quiet, yes, but the actor makes you feel her every emotion without saying anything: Her joy, her caring, her pain, her resentment. It makes sense that she has a teaching background. In a recent interview with Thrillist, she explained that she was drawn to the profession to mold kids into better humans. Her work in Roma could do the same. I met up with Aparicio in the lobby of the Bowery Hotel one day in November, a few hours before she went to a screening of the film attended by the likes of Anna Wintour and Michael Moore. With the help of an interpreter, we talked about her life before and after Roma. Thrillist: I wanted to ask you a little bit about your life before Roma. You were teaching? 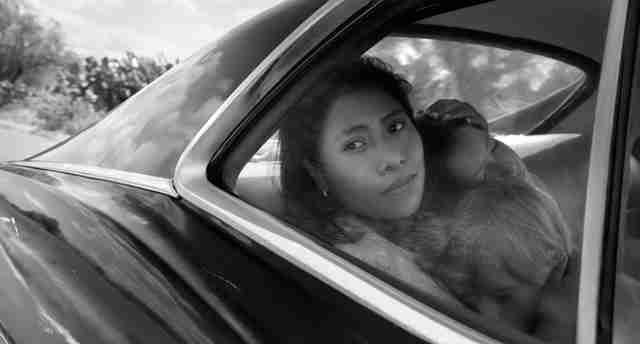 Yalitza Aparicio: I was getting my certificate. I was studying. Aparicio: To be able to teach the kids and to be able to change something. Because kids are sort of like sponges, who absorb everything it's a lot easier to teach them to be more human than to try to teach adults to be more human. What interested you about the prospect of the audition? Aparicio: At first I was not actually interested in it at all. I didn't want to do the casting. It was more my sister who was actually interested in the casting -- more interested in what the process was like than any idea she would actually get the role. Aparicio: The director of the Casa La Cultura, the house of culture, directly invited her. In Oaxaca, in Tlaxiaco, which is the town we are from. Aparicio: It was very long. At first it was just questions about our own personal lives. They took pictures of us. They recorded everything. And initially they said they just wanted to learn about us. The second audition happened in Oaxaca City, which is the capital city of Oaxaca. I actually live three hours away. So I had to travel to Oaxaca to do the second audition. What was your sister's reaction that you were farther along in the process? Aparicio: For the first casting call I ended up going by myself because she was pregnant and in a delicate position. In the end they ended up insisting that she came so she did come and she did do a test. But as it turns out she was going to give birth during the time. So she wouldn't have been able to participate anyway. She was just happy for me. At what point did they tell you about the story and what was your reaction? Aparicio: So it was actually Alfonso at the last casting where I traveled to Mexico City to see him and he was the one who told me it was a very personal story and it was a story about his mother, but he actual meant he had two mothers. He had his own biological mother and then Libo, the woman on whom the film is actually based. Were you familiar with Alfonso's work at all? Once you got the role did you watch all the films? Aparicio: So at first he asked me if I had seen any of his work and I said no. He said, "Have you seen any of my films," and I said no, and he said, "Well, great actually. I don't want you to burden your mind with any of these things so I don't want you to watch any of them. If you want to watch them once we are done you are welcome to." What was the preparation? Was there anything Alfonso wanted you to do? Anything you wanted to do yourself? Aparicio: So initially he did not, for example, give me any kind of acting classes because he was interested in things being natural and not overacted. So what I actually just did was to embrace the character to behave and act as if I was Cleo. And allow the things that was happening as the shoot was going on to surprise me and react to them. Did you get to spend any time with Libo at any time during the process? Aparicio: I met her before the shoot. So what she told me was the same thing Alfonso told me, which had to do only with her past, where she had come from, how she had arrived to the city, how it was like to work with the family, but she actually stopped giving me information until the point where the film actually starts. Aparicio: I don't know, but I would guess that because I was not trained as an actress they did not want that information in some way to influence the ways in which I would react to particular situations that would be presented as the film went on. Alfonso did not give the cast the script, and I believe in the birth scene you didn't know whether the child was going to be alive or stillborn. How did you process that? Aparicio: It was always very surprising. And I always tried to imagine they were not real, that perhaps they were fictional. But the fact is that I knew that they belonged to Libo and to Alfonso's memories so it of course affected me. So what I did is I just really took on the role of Libo which was really Cleo and I allowed myself to react to situations that were happening as if they were really happening. So if I saw someone hitting a child I would react to it in that manner. I actually allowed myself to just be affected by the things that were happening. In fact, the one with the birth was the most difficult scene for me to calm myself down. One of the things that really shook me and left me in shock is not only what happens during the scene but also thinking about my sister. Thank God, her child is fine, but she went through some difficulty. It got me to think about how many women experience this and have gone through this. It really took a long time for me to calm myself down after that scene. What did you do to calm yourself down? Aparicio: So Alfonso hugged me after the scene was over and the entire crew was crying. So they all in some ways sort of held me. That helped me calm down a bit. And then once I left the set I tried to leave that scene and that moment behind on the set. Had you spent a lot of time in Mexico City before? What was the experience like? Aparicio: I had never been. I moved there, but really I spent most of my time there really on set or waiting for the scene to start because in fact I was in most of the scenes. So to pass the time while I was waiting for scenes to be set up I would draw to pass the time. Were you spending a lot of time with the cast? With the little kids? Aparicio: So for example while we were waiting often times we would play with them. Often times they had to do homework so we would actually help them with their homework. Though sometimes it was English homework so I couldn't really help them with that particular one. What was your familiarity with that time period and the Corpus Christi Massacre, which is dramatized on screen? Aparicio: I was on a very superficial level in the sense that I had studied in school events like that had happened in Mexico. So I had some vague idea of the time period but it also helped talking to my parents who of course had some memory of the period and even of the songs that were sung at the time. Aparicio: The Juan Gabriel song. The one where I'm upstairs and Cleo is washing and the chorus says, "I don't have money." That was one of the ones that was a favorite of my mom's. What's it been like since the film has been premiering and hearing people's reactions? Aparicio: So it's actually been a wonderful experience, and it was somewhat of a surprise because I knew the film was shot in black and white and I thought people weren't going to want to see that. The other thing I really enjoyed is the people who contacted me to tell me they can't wait to see the film. And on the other hand the people who have seen the film who then come up to you and share what the film kind of evoked in them. Their own memories. Did you finish your teaching degree before the film? Having you been back to teaching? Aparicio: I finished a month before the shooting and while they were editing the film I had about a four to five months break where I could teach, but I haven't been able to do it full time. Was it strange to go back? Aparicio: Being a teacher is something I've always wanted to be so it wasn't that difficult because it was actually a gift to have at least that little time to teach class. You talked earlier about teaching humanity. Has doing a film like this influenced your viewpoint at all about how we teach humanity to one another? Aparicio: Equality in particular is one of the things I took away from it and how we are really equal to each other and kids are really the perfect subjects for this because they don't actually see difference. It's the adults who then teach them about difference. At the end of the film, there's this beautiful moment on the beach where the family embraces Cleo. But when they all arrive back home, Cleo returns to her role as a domestic worker. The last thing you see is her going up the stairs. What was your opinion on the ending? 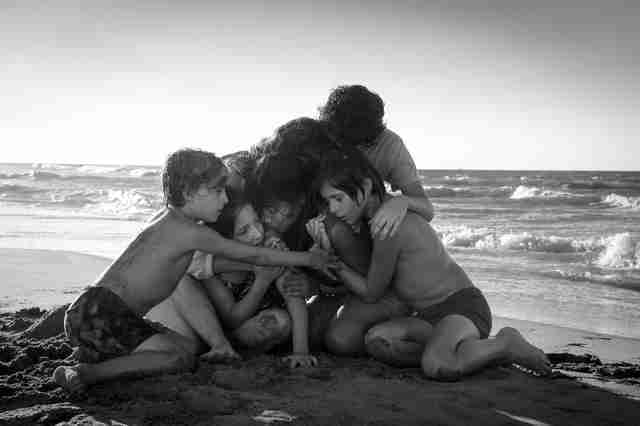 Aparicio: I was also surprised about that ending because there is that moment on the beach where it's quite evident that she's part of the family unit and then as you say when they get back to Mexico City they all start asking her for the things they need to have done. But my sense is she's still part of the family but that she's also still very well aware of what her duties as a worker are so she falls back into that role. I actually haven't had the chance to ask Alfonso this but the film does seem to do this down and up and down and up and down and up movement and I am very struck by the fact that she has overcome everything that has happened to her and it ends with her moving upwards. I wonder whether the message is that she's going to continue to succeed and move upwards in life.